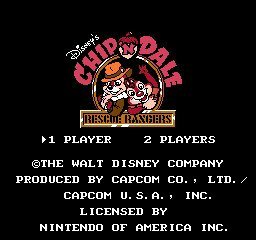 All games in tagged with "Chip 'N Dale Rescue Rangers"
Chip 'n Dale Rescue Rangers (チップとデールの大作戦 Chippu to Dēru no Daisakusen?, lit. "Chip 'n Dale's Mission") is a platformer video game developed and published by Capcom based on the Disney animated series of the same name. Originally released for the Nintendo Entertainment System in Japan and North America in 1990, it would later come to Europe the following year, as well as receive a port for the Nintendo PlayChoice-10 arcade system. The game would go on to sell approximately 1.2 million copies worldwide.